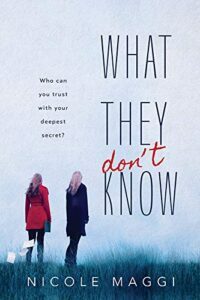 Nicole Maggi’s What They Don’t know will take you on a rollercoaster ride of emotions that leave you feeling some kind of way at the end. With that said, I loved this book. I really think Maggi nailed that inner struggle I can only imagine people have after an assault and not knowing what to do when their previous beliefs collide with their current situation. Maggi showed that understanding that comes with “walking in the shoes” of someone in a different situation. Mellie had her firm beliefs until her situation caused her to question them. It’s a hard hitting topic that a lot of authors skirt around or choose not to use in their work. Maggi took the topic by the horns and took us on a journey in the minds of these incredibe teenagers. I will definitely be checking out more of Nicole Maggi’s work. She has a smooth writing style that transitions well from one moment to the next. What They Don’t Know had a slow rise to the peak of the story and then was like riding a roller coaster down as you watched everything settle into it’s final moments. I love how this isn’t necessarily a happily ever after story. It’s just a story where lives continue, not everything is perfect, and you want more when you are done. Fantastic writing. Well developed characters. A gripping story. What They Don’t Know by Nicole Maggi is available now on Amazon, Barnes and Noble, and you can check your local bookstore. Also make sure to add it to your To Reads list on Goodreads and leave feedback for the author when you are finished. Check out more books from author Nicole Maggi on her website here!